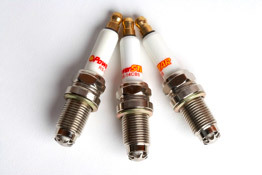 Today sparkplugs use various technologies to produce longer lasting spark plugs. Platinum, Iridium, and yttrium are used as center electrodes, combined with nickel alloys. Platinum center electrodes have been used since 1982. Iridium is a newer metal used and has produced some of the thinnest center electrodes. The use of these metals achieve less molecular breakdown of the material where the spark jumps the gap. While these metals themselves in most cases don’t actually help get more performance they help by making a finer electrode that produce a concentrated spark. Mostly they help with increasing the longevity of the spark plug from about 30,000 to 45,000 miles for a standard plug, to 60,000 to 100,000 miles. Some manufactures use multiple grounds to better increase the longevity and minimize the number of misfires. With the use of these exotic metals the wear curve for the spark plug is extended to the point that it much harder for the user to realize that performance of their vehicle is diminished. The average person will not take their car in for service unless there is a breakdown or some light or service reminder appears on their dashboard. This is main reason why these metals are used in today’s cars. The speed of the explosive flame kernel's (flame front) expansion in the combustion chamber. Unlike the multi-ground electrodes, that only have a single electrode with multiple paths from the center electrode the PowerSTAR tip provides a complete set of gaps with both anode and cathode electrodes. Since there are multiple paths and the least path resistance is matched between the gaps multiple ignition spark arcs are created to the ground ring. The plug is pre-gapped at the factory to extremely tight tolerances that equalize the gaps between the groups of electrodes. The ignition event in the combustion chamber is spread out over a wider surface area rather than concentrated around the center electrode as in all other spark plug designs. In the PowerSTAR spark plug the high voltage discharge of the ignition system causes the electrons to flow through the center electrode to the surface of the dome shape star. The charge builds up on the surface of the dome till it causes a plasma to form. The high voltage in the spark plug creates an intense electric field that is strongest at tips of the stars. Electrons will emit easier from hot surfaces and hot surfaces emit electrons the easiest. Furthermore, electrons are emitted easiest where the electrical field strength is greatest. The dome shape of the star with the sharp tips, in the electric field, creates a corona discharge that helps complete the path to ground for the spark to follow. The high voltage electromagnetic field causes the spark energy to split toward the tips of the star and produces a simultaneous ignition event in all the points of the star. As a result of the multiple simultaneous ignitions and the Corona wind generated, the air-fuel mixture is ignited faster. Combustion of the air-fuel mixture occurs and since it is spread out over a larger area in the combustion chamber the entire air-fuel mixture is ignited in the combustion chamber up to 30% quicker than original equipment or standard after-market spark plugs. Tests show that when the surface of the piston reaches top-dead-center (TDC) on the combustion stroke, the size of the flame kernel/head produced by a PowerSTAR tip spark plug is already many times the size of the flame kernel/head produced by conventional spark plugs. When the entire air-fuel mixture in the combustion chamber ignites quicker, the vehicle’s on-board computer, getting readings several hundred times a second from the knock/detonation and oxygen sensors, automatically advances the timing of the ignition spark from between 14-10 degrees before TDC to between 6-2 degrees before TDC. In other words, the vehicle’s on-board computer is maximizing the extra horsepower produced by this faster combustion process. 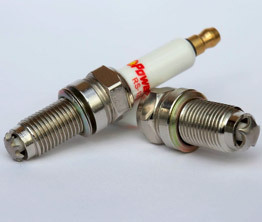 Tests show that, for the same amount of fuel, using PowerSTAR tip spark plugs result in more horsepower and torque than conventional spark plugs. This boost to engine efficiency results lower harmful emissions like Hydrocarbons from un-burnt fuel. You will get better MPG and lower CO2 output while reducing emission levels. In fact our tests show a reduction in Hydrocarbon and Carbon-monoxide emissions of 30%. This results in less HC and CO going into your Catalytic converter. Your Catalytic converter doesn’t have to work as hard. Because you need to burn less fuel you will save money and lower your CO2 output in getting from point A to point B.